Limassol is the second-largest city in Cyprus and is surely one of the most attractive. With its wide stretches of sandy coastline, pure azure waters, picturesque Old Town and abundance of historic buildings, there is something for everyone in this radiant city. Ideal for a family holiday or a romantic getaway, Limassol boasts an enormous variety of things-to-do: whether you're immersing yourself in its history at one of the many museums, taking a pleasant sunlit stroll down the wide seaside promenade, walking in the castle where Richard the Lionheart got married or lounging with a cocktail at the beach. Our collection of the best places to stay in Limassol range from quaint spots in the heart of the historic centre to luxury beach stays. Limassol's Old Town is a labyrinthine maze of narrow cobbled streets that bustle with life and colour. They are centred around Limassol Castle - where the crusader king Richard the Lionheart got married - which also houses the Medieval Museum of Cyprus, one of the best museums on the island, regularly the host of national exhibitions. The castle itself has an exterior of Turkish design, owing to the fact the Ottomans rebuilt it in 1590. If you're a history lover, you will revel in visiting Kourion - an archaeological site dating back to the Romano-Greek period. There is an amphitheatre, baths and a whole host of ancient villas with some gorgeous mosaics. This area teems with stylish bars and gourmet restaurants, as well as some fine upmarket shops. On St. Andrew's Street, for instance, you can find chic boutiques and tailors selling made-to-measure clothes and handmade shoes, while on Makarios Avenue, you can find designer stores. Also in the historic centre is Limassol's Old Port, a wonderful place for a bite-to-eat of hearty seafood, and where you can watch the colourful little fishing boats bob serenely in the waters. As you head east you reach the Cathedral, Agia Napa - a spectacular example of 19th-century architecture - and some of the best beaches in Cyprus. Dasoudi Beach, for example, was awarded the Blue Flag and is a lovely pebbled sandy beach ideal for sunbathing. If you want to join the locals, head to Lady's Mile Beach but for something more secluded, the Governor's Beach is your best bet - a lovely limestone cove - perfectly secluded. Take some time to stroll over towards the municipal gardens, a public park baring a small zoo and an amphitheatre - and the site of the annual Wine Festival that takes place every September. Sip a cocktail and lounge with a good book on the pristine sands of Dasoudi Beach! Immerse yourself in Limassol's ancient past by exploring the ruined villas and theatres of Kourion. Take in the sea-air and stroll along the promenade at sunset. Walk along St. Andrew's Street and check out the boutiques selling handmade shoes and tailored clothes! Bathe in the cultural heritage of Cyprus by going to one of Limassol's many museums, from the Archaeological Museum to the Medieval Museum of Cyprus - held in Limassol Castle. With so much to offer it is no wonder that this is a popular destination so to ensure a room at one of the best places to stay in Limassol we recommend booking well in advance. Alasia Hotel: ideal for exploring the historic centre, Alasia offers 61 chic and bright rooms complete with parquet flooring and marble-tiled bathrooms. The private balconies offer commanding views of the sea, and the spa facilities are as indulgent as they come. Amathus Beach Limassol: an enormous luxury chain with its own private beach, it offers contemporary rooms with private balconies. Ideal for families, there is a fully-staffed kids club and both indoor and outdoor pools. Londa: on the coast just outside the city, an effortlessly cool hotel with 68 white and modern rooms with private balconies. There is a spoiling spa and stunning sundeck overlooking the sea. Ideal for couples. Our partner Booking.com has a wide range of villas and apartments in the nearby area. The best time to go is during the autumn when you miss the summer tourist crowds and the unbearable heat and the temperature ranges between 17 and 29 degrees. Fly to either Larnaca or Paphos and get public transport to Limassol. If you want to rent a car, contact our partner Rentalcars. 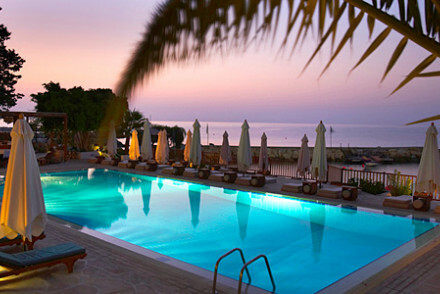 Expand your search to include the best places to stay in Paphos. 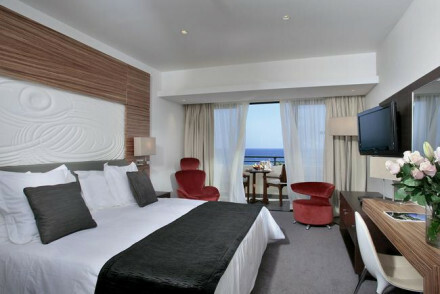 Widen the field and look at all the best places to stay in Cyprus. A chic luxury hotel offering commanding views of Limssol Bay. All rooms feature parquet flooring, marble-tiled bathrooms, earthen furniture and private balconies. Boasting extensive spa facilities and located within walking distance of the coast. Spa breaks - Indulge in a massage at the spa or unwind in the sauna and steam room. Local exploring - Ideally located for exploring the region's historical sights. Sights nearby - Visit the nearby sites of the Amathus Ruins, the Curium Amphitheatre or the Kolossi Castle. Private Hot Tub - Book the Executive Suite for your own balcony with private hot tub! Luxury hotel chain flagship with large grounds, top-notch facilities and service, close to archeological sites. Huge rooms, great views, lovely pools, private beach and excellent restaurants. Barefoot Luxury - For total relaxation. 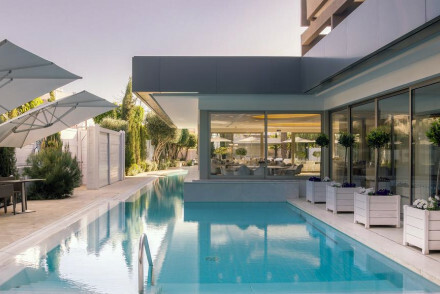 A cool contemporary chic hotel on the coast just outside Limassol. All white rooms and suites are modern in style with huge bath tubs and private balconies. Stunning pool deck over the sea, excellent food, and a luxurious spa. Ideal for a lazy summer holiday. Sights nearby - Crusader castle at Kolossi.